Tobin Heath scored the only goal in the U.S. women's soccer team's 1-0 win over Brazil in the SheBelieves Cup. 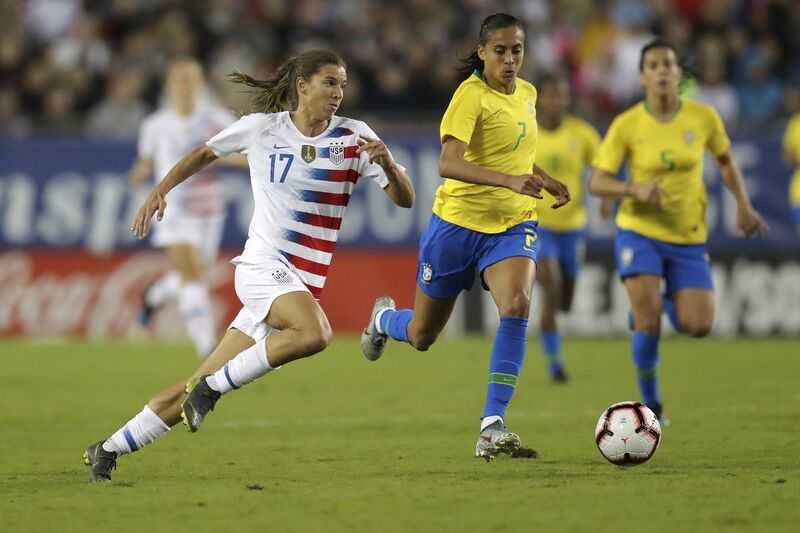 Fueled by a renewed focus on defense and a well-taken goal by Tobin Heath, the U.S. women’s soccer team defeated Brazil, 1-0, in their final game of the SheBelieves Cup on Tuesday in Tampa, Fla. The game started with some fireworks, as the Americans got a chance to score just 15 seconds after kickoff. Heath broke free down the right wing and crossed for Mallory Pugh, who was elbowed in the back by Thaisa in the 18-yard box on the way to the ball. The hit sent Pugh to the deck, but referee Carol Chenard let it go. Megan Rapinoe put the ball in the net in the 13th, but was just offside when played through by Heath. Six minutes later though, the U.S. got on the board. Heath led another charge downfield, and after Alex Morgan’s shot was stopped, Heath pounced on the rebound and smashed it in from 17 yards. The rest of the night belonged to the improved defense, and Sam Mewis played a big role. U.S. coach Jill Ellis’ deployed the box-to-box midfielder next to Julie Ertz in the central triangle, instead of making Ertz backstop two attacking playmakers. It was Mewis’ first start since last October, and just her third since the beginning of 2018. It also helped that centerback Becky Sauerbrunn’s return to the starting lineup. She did not play against Japan because of a minor knee injury, and was a 60th minute substitute against England. Both games were 2-2 draws. Brazil had a big chance to tie the game in the 76th minute, but U.S. goalkeeper Ashlyn Harris made a point-blank save to preserve the lead. Harris also snuffed out a free kick from Brazilian superstar Marta - a teammate on the NWSL’s Orlando Pride - in the 80th. The U.S. was able to see the game out from there. England scored three goals in the first 30 minutes and the Lionesses went on to defeat Japan, 3-0, on Tuesday to win the SheBelieves Cup. Lucy Staniforth scored from out front in the 12th minute for her second international goal, giving England the early lead. Karen Carney’s header in the 23rd minute made it 2-0 before Beth Mead’s goal into the left corner put England in firm control. England, which finished third at the 2015 World Cup in Canada, has four exhibition matches scheduled before heading to France. The Lionesses will host Canada and Spain in April, Denmark in May and New Zealand in June. Japan has friendlies against Germany and France scheduled before the World Cup. England and Japan play in the same group in France and meet on June 19 in Nice.